The idea came to life at the beginning of 2006, following a visit by a soccer team from the region of Friuli, in northern Italy. The team arrived in Israel, and held a number of friendship matches in different parts of the country, including a game with the youths of Kibbutz Sasa in the Galilee. When this special match was over, and after hearing a lecture on the Beresheet LaShalom Foundation’s efforts to educate toward dialogue between people of different cultures and creeds, the Italian team proposed creating a mixed Arab-Jewish team, of children and teen-agers from the Galilee. They promised to invite the team to play in the annual summer tournament, known as "Conosciamoci" - “Let’s Get Acquainted”. 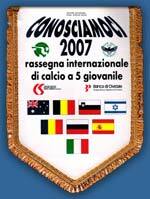 The tournament is for youth teams from different countries in Europe and elsewhere, in particular multicultural teams. Despite the great difficulties, we decided to create a mixed team. Now the team is in its third year. The children come from communities in the region: Gush Halav, Safsufa, Kerem Ben Zimra, Dovev, Avivim, Sasa, Me’ona, Fassuta, and others. They meet every week, with their coach Fabio Kenig from Sasa, who has coached the team for three years now with great devotion, entirely as a volunteer. The team practices as guests of Kibbutz Sasa, which grants them to use its playing-field. There is good cooperation with the soccer coaches in the area, as the children also play on other teams, and the training times are coordinated accordingly. 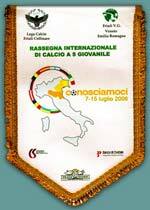 During the summers of 2006 and 2007 the team played in the tournament "Conosciamoci", which was held in Udine and organized by the Amateur Sports Association of the Venice-Friuli region. The association maintains a soccer league to which 80,000 players belong, and everything is done to advance popular and social sport, purely on a volunteer basis. The mood is good among the team members, and the children get to know one another despite differences in culture, language and customs. They find a common language through sport and soccer. The important message is, that all paths are good that lead to positive closeness between people, especially between these young people, who often find it easier to come together than their parents and adults in general. Much money must be raised every year to maintain the team. Our hope is that we succeed in carrying-on this important mission. 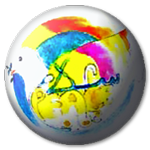 You are invited to participate and contribute to this valuable and distinctive project, in order to allow it to continue to exist and grow, and to create together a better future for our children.